I have difficulty overall with the JLA and JSA Classified series and their Superman and Batman Confidential offshoots -- supposedly these are a-continuity series that anyone can pick up and get a quick story. Not coincidentally, they make great trade paperback fodder, for which you might think I'd be pleased, except that these are essentially inconsequential stories that glut the market and make it harder for the "true" trade paperbacks to shine. 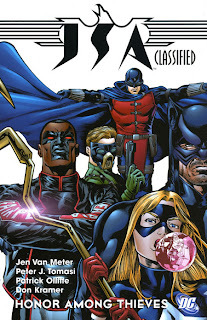 But I did buy JSA Classified: Honor Among Thieves (the second JSA Classified collection after the Power Girl trade) and read it the other day looking for something quick, and what I found did exceed my expectations. The two JSA stories here, one by Jen Van Meter and the other by Peter Tomasi, read like try-out stories by first-time writers, in an appealing way. Both stories have their problems--Meter's work, as with Outsiders, suffers from a confusing denouement and some off characterization, while The Comic Treadmill does a good job showing how Tomasi's story seems to favor bloodletting over sense--but these are slight mis-steps in two stories where it's obvious the writers are learning to find their way. Meter adopts the tones of a crime procedural in "Honor Among Thieves," and while this is not nearly as slick as Bill Willingham's early Fables heist, the narrating Icicle is an interesting character. Tomasi's story, "The Spear and the Dragon," plays well with a bunch of old JSA history, and any admission price is worth artist Don Kramer drawing Wildcat. Both stories are Infinite Crisis tie-ins, and it's interesting in retrospect to see how some of the "outer" titles, like the loosely-connected JSA Classified, tried to tie themselves in. "Honor Among Thieves" features characters from Villains United, but the heist that takes place here is never actually reflected in the mini-series itself. "Spear" proportedly takes place between the pages of Infinite Crisis, though it's hard to believe either Wildcat or Jay Garrick had that much free time, letting alone the completely incongruous reference to New Year's Eve. One can hardly blame the writers and editors for taking advantage of the crossover, but the result reeks slightly of desperation. So JSA Classified: Honor Among Thieves isn't going to win any battles, but it does strike me as an interesting study piece for someone looking for short pieces from which to learn about writing comic books.